It's almost the 3 week mark since we lost our T-Bone. I still think of him daily and miss him terribly. I finally have his ashes back and he's in his final resting place here at our cabin in WV. We decided we'd keep him up here as it was his favorite place, and he never got to see our new house, so WV was home. 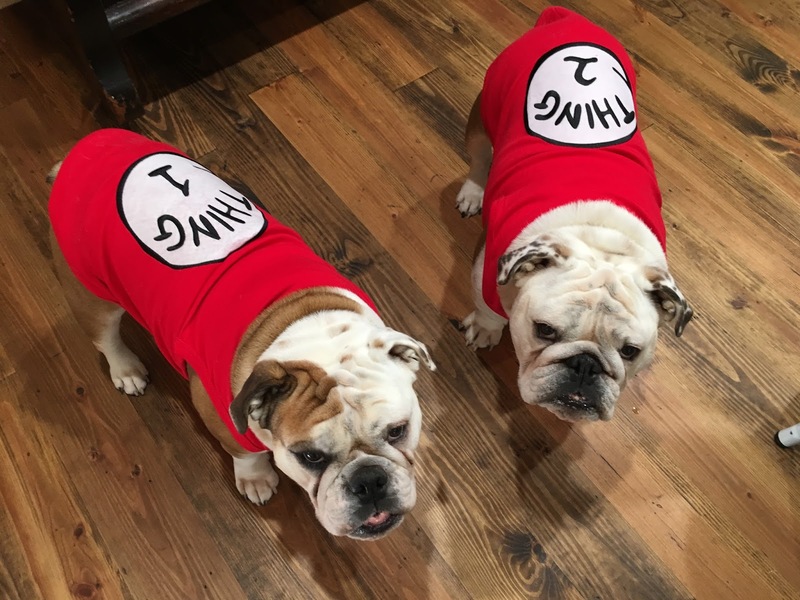 Sarge and Stella are coping just fine. You'd almost think they don't miss him. Sarge has begun to fill in T-Bone's shoes by staying close to me. He's my new shadow. We were back in South Carolina the last full week of October and the pups had their annual check up! Our vet confirmed Stella has an injured ACL. She's still limping from time to time, but we are keeping her rested, loading her up with supplements and giving her some Rimadyl to help with pain/discomfort. We will be ready to move in our new house right before Thanksgiving - so, when we are back we will try the laser therapy our vet does in hopes that we don't have to do surgery. So, send her well wishes that we can remedy her injury without surgery. Sarge checked out great. He's been getting a little slow on the stairs from time to time, so I mentioned that to our vet. He's already taking Ligaplex and Glucosamine, so we added some Omega-3 to help with joint support. The joys of aging! They got their rabies and kennel cough vaccines, so they are good to go! 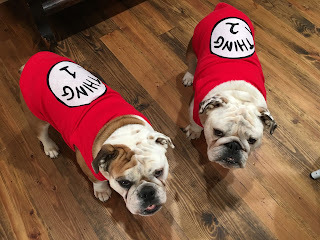 They had a great report on their overall health, so I'm a happy bulldog mom! 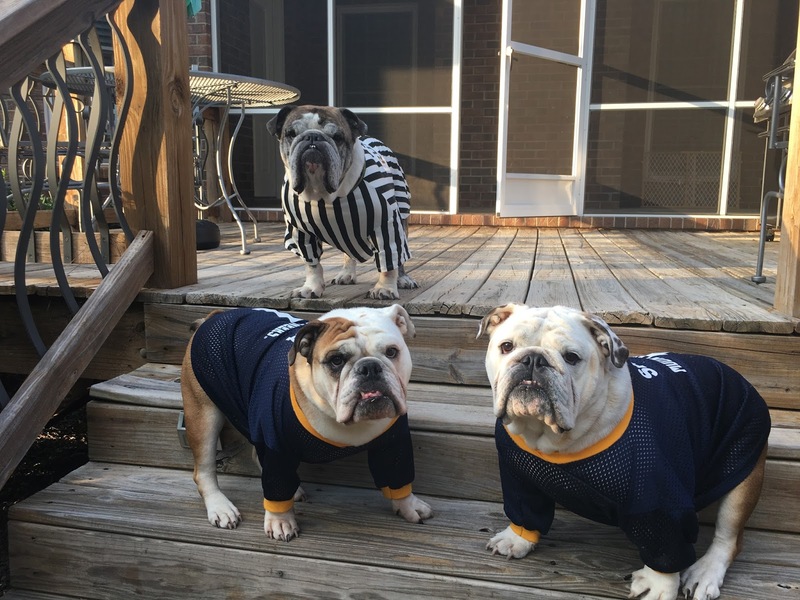 Me and the pups were up in WV for Halloween (Will was down in SC still for work). I hardly ever plan in advance, but this year I did. 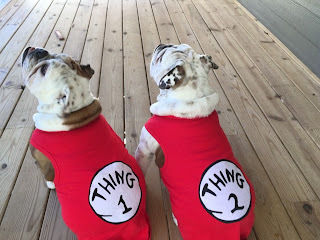 I ordered costumes in September!! 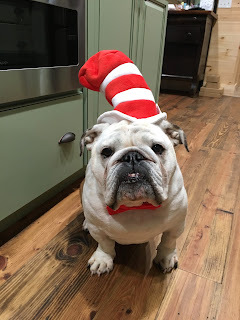 T-Bone was going to be the Cat in the Hat with Sarge and Stella as Thing 1 and Thing 2!! I was so proud of my idea! 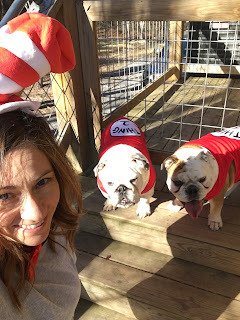 I even sported the Cat in the Hat costume so we could still be a trio. Then, I had Sarge model as Cat in the Hat!! Isn't he precious! 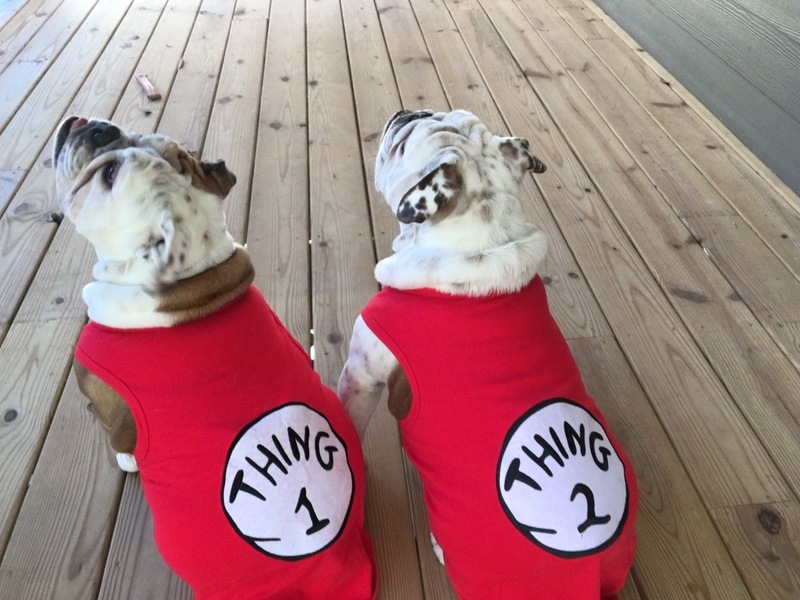 When looking through some old pictures, I realized I dressed the pups up last year to match too! Weren't my WVU football players and referee cute? Not a whole lot else going on. Just anxiously awaiting the move!!! Yay! !